Have you ever wanted to create something beautiful yourself? Do you love pearls as much as we do? Then how about you let your creative side take over and experiment with loose pearls! Create gorgeous jewelry, one-of-a-kind clothing items, and unique decorations. If this appeals to you and you’re curious to learn more about how to do all this, then read our article and become a DIY queen/king! We’ll tell you about the tools you need to have to turn your ideas into exceptional pieces, provide you with some inspiration, and also a few tips and tricks to make gorgeous pieces! So, without further ado, read on to find out how to get creative with loose pearls. Once you’ve set your mind on creating something with your own two hands, you’ll need some loose pearls. We recommend that, at first, you stick to cheaper and lower quality loose pearls and then graduate to higher quality beauties. Before even opening your laptop to see the prices and start looking for loose pearls for sale, you need to learn all you can about pearls. How to spot valuable ones? What is the difference between freshwater pearls and South Sea pearls? What is the color palette of Akoya pearls? For more information on pearls, their value factors, history and cultivation, we recommend you read our very own pearl education section. It’s imperative you know this information, before creating anything with pearls. One last thing, before making an actual purchase, make sure you study the market and get a good deal on your loose pearls. And then comes the vital question: To Drill or Not to Drill? Think about what exactly you’re thinking about making. Do you want to stick pearls onto a wooden box or on a sweater? Then get undrilled pearls. You can find on our real loose pearls section a wide variety of pearls. Thinking about creating earrings, or necklaces? Then get drilled pearls! In time, you’ll even be able to do the drilling yourself if this is something you’d like to pursue in the long run. Any DIY lover knows that you simply can’t make things from scratch, you need to have the right materials and especially the right tools. Here is a list of the tools you simply must have in our collection if you want to create loose pearl jewelry. A work bench or surface. You need to have a clear and sturdy place to work and create. No need to explain this one! Cleaning supplies. Once you’ve created your piece of jewelry, you’ll need to clean it in order to be sold or gifted. Various cloths and creams are available, but if you’re searching for something a bit more professional, we recommend a steamer. Be careful with ultrasonic cleansers and pearls, though, they can damage the gems! Get yourself a pair of chain nose pliers, flat nose pliers, round nose pliers, and crimping pliers. Don’t even think twice about it! A pair of sturdy wire cutters is something you simply need to have before getting your hands on any loose pearls. Ring mandrels. Want to give ring making a try? Then you will need some silver ring mounts (silver is very cheap and it’s not worth going with any other type of metal) and some ring sizing and mandrels. Soldering materials. If you’re just beginning your journey down the DYI road, then maybe you can put off soldering for a while, but it’s still a great method of creating beautiful jewels. Thread. If you’re planning on creating pearl necklaces, then you need good quality thread that won’t damage your pearls and will be study. Silk thread is an obvious and popular choice. Storage containers. Last, but definitely not least, you will need to be organized. Which means that you’ll need some storage containers to keep everything tidy. Nothing kills a creative impulse like an untidy and messy work surface. So, you’ve gotten into the jewel/loose pearl-making business and you don’t know where to begin. You need some help? Pearls Only to the rescue! Here are three ideas that will get the ball rolling for you and make you fall in love with DYI! Just look at this simple, wooden storage box. It has so much potential! Dye it the color of your choice and glue some simple, pearls on the top and it’s done. Or maybe, cover it in a silk fabric and then sew some loose pearls on top and on the edge. Isn’t it great to have a simple, unadorned object that you can transform to your heart’s desire?! 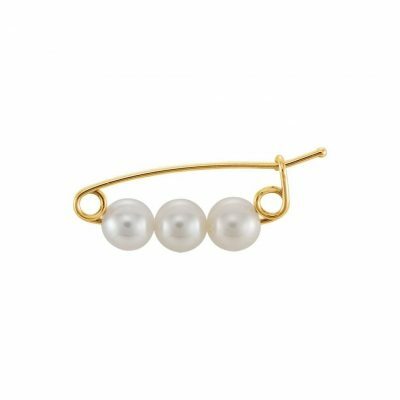 This style of pearl earring is probably the simplest and easiest type of jewelry that you can make. You only need some good glue, good pearls, and some studs. The only action you need to take is carefully glue the pearls to the studs. I mean, that is really the easiest thing you can do as a jewelry maker, thus perfect for a beginner! Another easy and gorgeous pearl jewel that is too easy to make. Make sure the pearls you have are of similar sizes and you’re good to do! With the right set of pliers you can even twist the brooch yourself. We recommend silver, it’s cheap and perfect for beginners! Focus on one type of jewelry. Don’t get ahead of yourself and start making too many things, because you will finish none. Take a few loose pearls and make a necklace. Then start work on another necklace, until you are completely satisfied with your necklaces and feel like you’ve got everything mastered. It’s going to take a while, so be patient! Invest in quality tools. As mentioned above, having quality tools is absolutely paramount. Don’t get too many, at first, a couple of pliers are enough, depending on the type of jewelry you’ve decided on making. Also, if you don’t want to spend big bucks on new tools, you can also go the second-hand route. Just make sure they’re in good shape and they don’t cost too much. Inspiration, inspiration, inspiration. Don’t ever stop searching for inspiration. Pinterest is a wonderful place to go and get inspired, as are various jewelry blogs and artists. Don’t be afraid to look for things that will inspire you. It could be a blog, but it could very well be a movie, song, or even a friend. Join a workshop or a class. You are never too old to learn new things, so join a jewelry making class or workshop. You’ll not only learn the basics of jewelry making, but you’ll also meet new and interesting people who share your passion and you’ll get a chance to do a bit of networking that’s so vital to DYI jewel makes. Have a work desk. Having a designated place where you can work is incredibly helpful to the creative process. This way, you’ll know that you can go there and create and nothing else. Make sure to keep it clean and tidy. If you don’t have lots of space, we recommend storage containers that you can store away and label. Trust us when we’re saying that you will have a lot of pearl creations! You’ll get so excited and start making more than you actually need. If and when this happens, you’ve got birthdays covered! Nothing says I care like handmade jewelry! Selling things online isn’t new, but these days there are so many platforms out there for artists that it’s becoming easier to hop on this train. Try Etsy or even Facebook market and who knows, you could be looking at a successful business! The upside of selling at fairs is that you get to talk to potential clients and do a bit of networking. The downside is that you’ll need to pay a fee to have your business and your products featured there. We hope that you’ve found some useful bits and pieces of information and that you’re on your way to creating your perfect pearl piece. If you can’t find it anywhere else, then it means that you need to create it yourself! So, let your creative side take the wheel for a while and get ready to surprise yourself. If you need more inspiration, then head on over to Pearls Only and discover gorgeous pearl jewelry. Remember, if you want to create something beautiful, you will need to persevere! But it will all be worth it! Loose pearls are too gorgeous to not be incorporated into a spectacular piece that will be loved! Whatever you do, remember to have fun!